Culturing enables the cultivation of a vast range of natural coloured pearls, from oranges to tart pinks to silver and blue-greys. 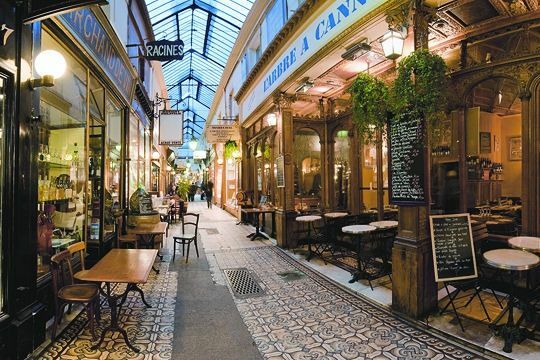 Time, then, to stroll the Passage and admire these luscious colours, mixed into one piece. We're looking for fascinating hues, in a size that suits grown women—pearls we can wear walking the dog or to a bistro, though we'll ogle some fabulous pieces too, to build our eye. Have you finished your allongé? Let's set off! The elegant London jewelers Winterson offer a lavish long rope (120cm or 47 inches) of multicoloured 8-9.5mm ovals. The colours include white, apricot, pink and lavender, which will glow on both warm and cool skin tones. Price, £550. Oh, promise me a rose garden! That is, an 11-13.5mm "Rose Garden" necklace (17.75 inches long) of semi-baroque CFWPs in dark and light lavender, peach, and pink. Somebody please turn on the fan. Price, $801 at Kojima Company. Luxe, multicoloured Tahitian rounds are a definite splurge. 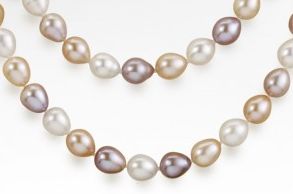 These are AAA grade 11-14mm pearls, with smooth surfaces, high luster and the tantalizing Tahitian palette: shimmery peacock, cherry, greys and blue-greys. Price, $6,900 at Pearl Paradise. This is a quieter palette than the much-photographed Nancy Pelosi necklace; if you prefer more contrast, a Tin Cup version in her colourway is here and offered in both 16 and 18-inch lengths. Well-priced, too, especially now that PP have a 14% off sale till the end of February! 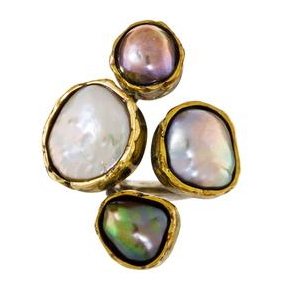 A hip, casual mix: Beth Orduna's multi-pearl cluster ring set in brass; price, $748 at Twist Online. A head-turning mixed-pink Pearlescence charm necklace; the voluptuous 13-14.7mm Kasumi-type pearls, pinned to silver chain, will dance. Again, all natural colours, 52cm (about 20.5 inches), which could also be shortened. Price, £150. Black/white pearl earrings: an uncommon and elegant signature of icons from the Duchess of Windsor to Oprah, and I have also seen them on far more casual dressers. Grande dames will simply order these Russell Trusso 12mm Tahitian white and dark blue-green "Day and Night" earrings set with 1.20cts of diamonds. Price, $6,250 at Gump's. Beladora have the last word in mismatched magnificence, South Sea yellow and gold flower earrings. 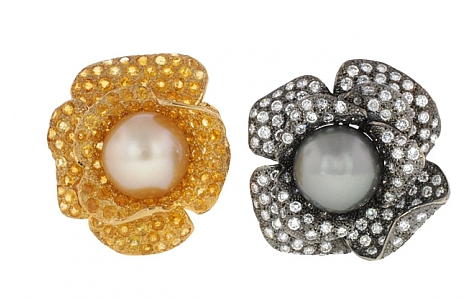 The pearls are a whopping 15mm each, lit by 7.50cts of diamonds, set in 18k yellow and 18k blackened gold. Price, $14,550. Wouldn't you feel like Rita Hayworth in them? And I even have the red hair. 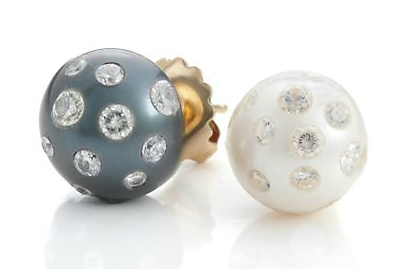 Back on the ground after jewel stratosphere, but still very special: colour-change freshwater baroque studs offered by Pearls of Joy. 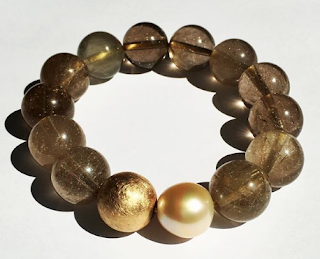 The 10-12mm pearls shift colour depending on the light, and show strong luster and intense orient. Price, $65. If you prefer a drop style, see the metallic colours here. And note that Pearls of Joy also have a 14% off Valentine's Day sale on now (but I don't know when it ends). It might also be time for jewelry box cleaning. A little-worn strand of whites could become a knockout rope by adding other colours; they need not match in size, but should harmonize. 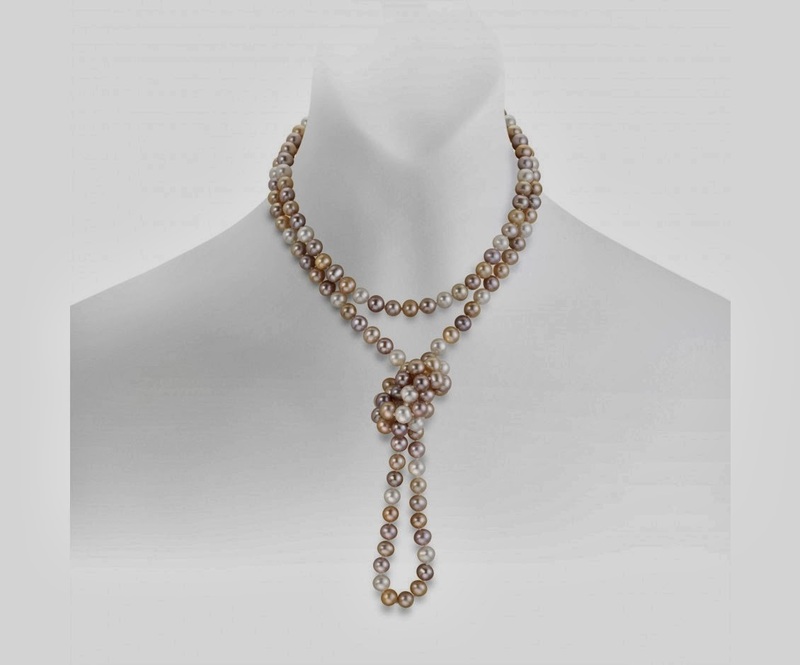 Here's an example: Kojima Company's 23-inch Long Pearl Medley necklace, which includes a big Japanese Kasumi, a Tahitian, and South Seas hanging out with lustrous 4-7mm South Sea keshis; price, $720. 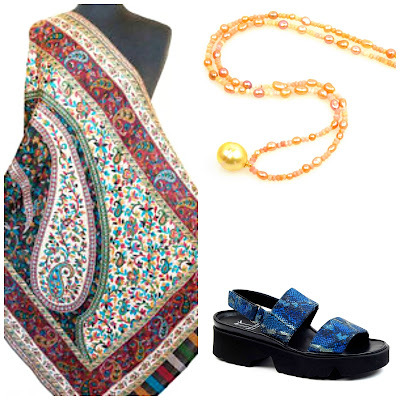 Scatter the coloured pearls among your whites or add them in a section, as shown here. You wouldn't have to choose South Seas or Tahitians, either; there's a world of freshwaters in intense or soft colours. Hiding in your drawer might be the start of your one-of-a-kind stunner. Imagine that with your spring sweater! Ohhhh, that ring!!! I am swooning. I confess to being old-fashioned here. Or classic, at least. I like my pearls all one color. Now, that color can be lavender, or gold, or pink, or whatever. But to my eye pearls look best when matched. Wow, those colours are amazing. Do you think the peaches and apricots shown in the Rose Garden necklace are accurate? So hard to be sure on a monitor. une femme: It's very 'you'! LPC: Nothing wrong with classic. LauraH: I asked Sarah Canizzaro, Kojima's owner, the same question. She said the photo is a little on the saturated side, as like most vendors, she shoots with a lot of light. That ring is a dazzler! There are so many gorgeous selections here! Wish I had the funds...but it is fun to dream! So pretty! I love the pearls with jewelled flowers around them but I couldn't cope with a black and white pair of earrings - it'd do my head in! I have coveted a pair of those etoile earrings for years, and now, the thought of a black-and-white pair has me swooning with desire. I also like the *idea* of tin cup necklaces (as the likelihood of my being able to buy those earrings is low right now), but I'm not sure about them in practice. It would, however, be one way to have my cake and eat it, too, with gum ball pearls that aren't too heavy to wear! 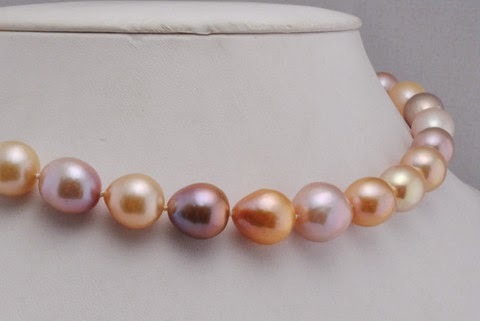 Gretchen: Tin cups are very good for managing weight of large pearls and also allow you to have higher quality pearls as you need far fewer- often just 9 or so instead of the over 30 in a full strand. Russel Trusso and Belladora would be just perfect for me. 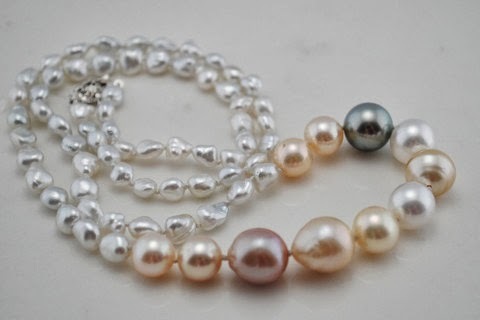 Do you feel that women of a certain age and grey hair maybe look too old wearing pearls. Too expected? Too ???? Sandra Sallin: Did you see my post on the grey-haired Christine Lagarde? Nick Vanello: Thanks for the link to the site, absoutely stunning pieces!